A young queen Elizabeth is pictured as part of an ornamental letter"E." Reproduced in J.R.Green, A Short History of the English People (1900). University of Victoria Library. Elizabeth grew up in a political environment in which beheadings were a normal part of government and Fortune could not be expected to smile lastingly upon anyone. The adversities and dangers of Elizabeth's early life taught her the importance of self-reliance, determination, and subtlety as necessary tools for survival. The executions of her mother Anne Boleyn and her cousin Catherine Howard must have had a profound effect upon Elizabeth. She was only two years old when her mother was beheaded. 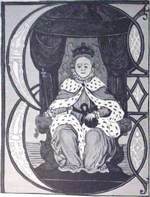 Elizabeth's birth was a bitter disappointment to the King, and he was never much interested in her welfare. Bereft of her mother, she was raised by governesses on a minimal allowance that was sometimes barely enough for clothes. However, during Henry's last years she temporarily regained her title as a princess through the influence of Henry's last wife, Catherine Parr, who became Elizabeth's guardian after the King's death. When Elizabeth reached marriageable age, the ambitious Thomas Seymour applied as a suitor but was rejected by the Royal Council*. (Thomas Seymour was brother to Edward VI's Lord Protector, Edward Seymour, Duke of Somerset.) Seymour then married Catherine Parr and involved Elizabeth in an interesting relationship which seems to have involved a little early morning playfulness in her bedchamber. Click here to read about Elizabeth's subsequent ordeals as a prisoner* in the Tower. Since the Princess was second in line to the throne after Mary, any marriage had to have royal approval; if she had married without permission she would have commited treason punishable by death. The last major ordeal of Elizabeth's early years was the reign of her fanatically Catholic sister. Elizabeth had to conform to Catholic ceremony but kept her devotions low profile. She became a focal point of Protestant plots to overthrow Mary, and after Wyatt's Rebellion in 1554, Mary kept her a prisoner--first in the Tower, then on the Norfolk estate of Sir Henry Bedingfield. Mary refused to name Elizabeth her successor until on her deathbed. Mary's rule provided an example of the divisiveness caused by extreme or inflexible policies; her blundering pursuit of her ideals ended in widespread hatred of her regime, and opened the way to popularity for a monarch with a moderate approach.